Welcome to our rural complex. We are located in Cuenca, specifically, in Valdecañas. 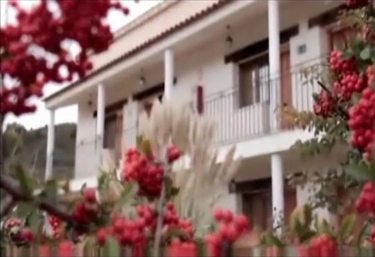 Our complex has 6 rural houses , which are rented from in full form each. We have capacity for a maximum of 8 seats in each of them. Therefore, we recommend it for a group of friends, for families, family reunions, etc. Although, anyone who wants to get out of the fuss of the big city, is welcome. Each house has 3 bedrooms and a sofa bed . A parking. It is exclusive for our guests. A barbeque area , where you can roast meat, fish and spend great times in the company of yours while you enjoy a good feast. We have different terraces, more private, where you can sunbathe, or chat. The pool, which is only 100m. You can go and give them a refreshing dip. We also have, for sports lovers, a sports area. In the outdoors you can enjoy a large garden area , where children can run without problems and, above all, without dangers. A social lounge. In this room you can have coffee, while you play cards or chat with your friends. A conference room. It is perfect to celebrate different meetings. We also have a cafeteria. You can have a drink, a coffee or try our sandwiches. We have a television and wifi. The cottages are perfect for friends, for several families , for couples, etc. We have capacity for 8 people. We have 3 bedrooms , each with 2 single beds. In addition, each room has a full bathroom , with shower tray. We also have a sofa bed in the dining room, which can fit another 2 people. A type dining room , with a table with wooden chairs. An area of ​​the room , where you have the different sofas and a television. The kitchen is fully equipped. 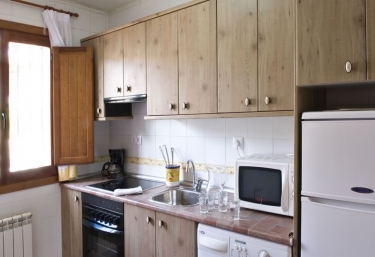 The furniture is made of wood and you can use the following appliances during your stay: washing machine, oven , microwave, ceramic hob, smoke extractor and a coffee maker. You can also use the kitchenware and the different utensils that we put at your disposal. It is one of our spacious homes, where you will be able to rest without problems, and with all the amenities. 3 bathrooms full of amenities. Un living room dining room amplia. It is one of our spacious homes, where you will be able to rest without problems, and having at your fingertips all the comforts. A living room ample, next to the kitchen area . Un total of 3 full bathrooms. 3 double rooms with very pleasant functional furniture. It is another of the family homes where you will be able to rest without problems, and with all the comforts. 3 double bedrooms ample, with beds dressed perfectly. 3 full bathrooms, with towel sets. A room that is both dining room . Inside this space you will feel at home, and meanwhile, you will enjoy the best tourism experience. The 3 double rooms ample, with a bathroom inside of each of them. A spacious dining room , with all the armchairs. It is a lodging in which you will be able to feel comfortable and be at home, with all the comforts. 3 double bedrooms, perfectly equipped. Una cooks with all the kitchenware. The Enchanted City . It is located on the outskirts of the city of Cuenca. She is known for the strange shapes that stones have and, in addition, several movies have been shot. The Hanging Houses , the best known. His cathedral, which has Gothic style, which was built between the SXII and SXIII. The Bridge of San Pablo . A huge iron bridge, with impressive height, which is very close to the Casas Colgadas. In Buendía , another town, you can enjoy the Route of the Faces . Stones carved in different shapes: faces, skulls, etc. A very picturesque place to go.